So I have a Samsung dishwasher that is installed poorly, I did some research on installation, and noticed they basically did it all wrong. It's connected on it's own circuit but it was installed as a plug, the drain has no air gap, nor a high loop, as well as connecting two hose types with a copper pipe as a joiner, and electrical tape as it's seal. The drain pump failed, due to a few things from what I can tell. I have a pump coming in, but would like it to be done properly, unfortunately I do not have a picture of the connection but attached is a super quality mspaint picture for example. The hose is roughly 15 feet long, and drains above the p-trap. No air gap and no high loop, but the line does run above the dishwasher. Here is an image describing how it's connected. What would be the best method to remedy these issues? Also, would an air gap reduce the pressure / effort the drain pump needs to do? Re: Dishwasher air gap, needed? 15' is a LONG way for a DW to pump! In my area, air gaps above the sink are the norm, in Shannon's region air gaps below the sink or a high loop are the norm, so, I'd say you could use either method, whichever you prefer. The key is to have it as high under the sink as possible, and that the loop be higher than the drain, this is to prevent backflow into the dishwasher should the drain back up. Because of the distance you've got to go, I'd recommend a single length of hose with the fewest bends and turns possible to minimize restriction of flow. Using a coupler between two pieces of hose creates a restriction, hence using a single piece of hose. I don't know that having the DW plugged in, instead of hard wired, is a big deal. What I've found is that if power is available within the DW cabinet, it's usually hard wired. I've also seen cords plugged in under the sink with the disposal. One of the resident sparkies will have to weigh in whether or not there are any code issues with a cord/plug. My thoughts exactly on the length, google tells me 10ft is basically the max I should be using if I don't want to buy a new pump every few years. As for the plug, it's on it's own circuit, but he added a plug instead of a normal box, easy to pull, but not quite the right way to install it. I'm in Canada, and haven't actually seen an above sink air gap, but wouldn't be opposed to one if it makes things easier. Since I am going so far, I just want to reduce the effort the pump needs to do. Single hose would be a big plus, less restriction, as well as it would help maintain a steady flow / pressure as the current solution has a leak. Would you recommend a type of hose that would be purchasable in bulk lengths? As there would be lots of soap, chemicals, bleach running through it, I want to make sure the right material for the job and not a future surprise leak. Thanks for all the insight, very helpful! 15 feet is a long distance. Are you walking far to get from the sink to the dishwasher? Or is the dishwasher at a 90 degree angle from the sink? The corrugated factory hose the dishwasher comes with is the type of hose you're supposed to use, and it's usually amply long if the dishwasher is adjacent to the sink-base cabinet. It is bendable, but the semi-rigid so it keeps its shape. But really any hose COULD work, you just need to ensure it maintains its shape and doesn't sag. You could possibly even use pex tubing if you get the right fittings. The air gap may or may not be required, depending on your jurisdiction. It never used to be required here in Minnesota, but this state decided to adopt national plumbing codes so they now are required here. But you absolutely need a high loop, or you risk back-siphoning waste water back into the dishwasher. 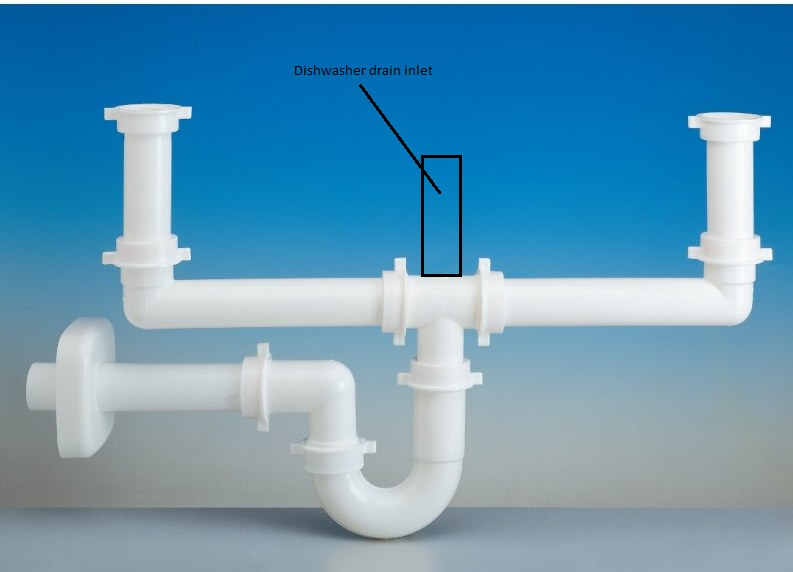 The connection to the drain under the sink is usually achieve either into the port on a waste disposer unit (which requires the knockout plug to get removed first), or to a tail piece that sort of juts out at an angle upward from a tailpipe connection under a basin drain BEFORE the P-trap. The plug-in is fine, but you can get around AFCI requirements if you have it hardwired instead. I would love to be able to put a Pex pipe, but I'd have to use couplers to do so as they use a slip on connection to the sink. As for the length, the sink is at a 90 degree angle from the sink, ran across the wall just below the countertops. I'll have to measure again, but total hose length is pretty darn close to 15ft, probably a little below since I cut out ~2ft of slack. It was installed for ease of access instead of doing it right. Like he was expecting his work to fail and needed quick access to give it more electrical tape to fix it all up. As for the high loop, if the hose is running straight, above the dishwasher loop, it would be almost impossible to build a proper high loop due to how it was ran, so probably an above counter air gap would be required, and from what I can see, would actually help the pump as it would reduce pressure in the pipe and not rely on the sinks as it's air source. I'll look into a hose at the HW store, just need to make sure it can handle bleach and dirty dish water. Edit: For running the hose, I see that he initially ran it on the bottom of the cabinets, but then changed it to just below the counter top. When I run the new hose, should I run it above or below? Running it below would give an easy way to add a high loop as it would be easy to mount the hose loop from there, but if it's not the right way I'd avoid it. Could you run ABS in the cabinets to get closer to the dishwasher and use the factory hose? Or if you have access under the floor could you run some ABS down there and get the hook up closer to dishwasher? You need to be sure that either way there is a P trap after the dishwasher hose hook up. The dishwasher hose should be run as high as possible at least somewhere between the dishwasher and drain hook up. OK, so this gets even better. I took a close look at the install, and found the problem, ALL of it is wrong. I will be fixing it in the coming days. I'll add a proper dishwasher drain, and replace the vent. - Used copper pipe to join together two pieces of different pipe then used electrical tape to couple them. So, looking at the manual, it's pretty clear it was trashed, and half the install material along with it. He even took the loop that is built into the dishwasher out to extend his hose, making sure it never stood a chance. The weird thing is, there are holes on the bottom of the cupboards, yet new ones were put on top, and it was rerouted. I'm just thankful I have a new drain pump coming in, so when this one dies of stress, I can swap it right out. Jeb, Could you please share a few pics of you are doing those things? Or did you follow any tutorials? If yes, please share them.